I had to share this post from Anastasia over at Stardust. I couldn’t have said it better myself if I tried. Love the graphic she included from Lizz Lunney too. “With so much disaster going on – planes falling out of the sky or just plain disappearing, conflict and bloodshed, that weird flesh eating virus that’s emerged (yikes! ), it can be easy to feel like the world is a terrible and unstable place to be. But it’s not all doom and gloom! Just like with our own bodies, we can choose to focus on the flaws or we can choose to focus on the bits we love, the same applies to everyday life. And whilst there are some truly horrendous events going on at the moment, like storms, they too shall pass. Next postOH THOSE ELDERLY PEOPLE! I know right, the news has been so upsetting we just turn it off. 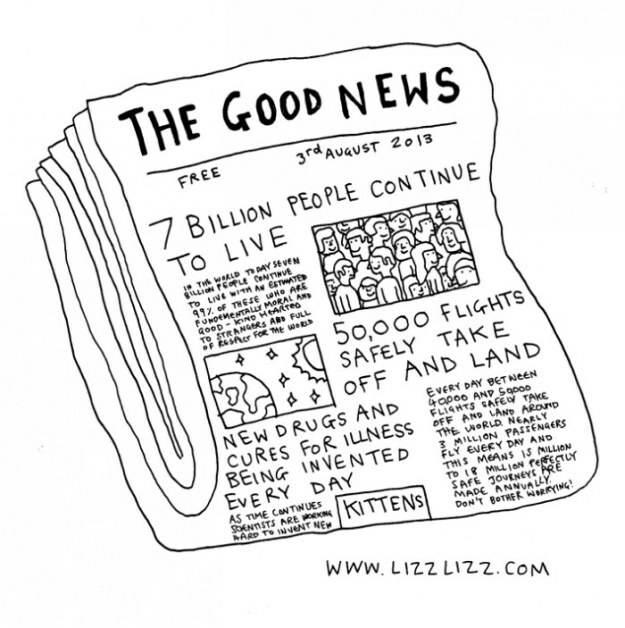 There are good things happening in the world too!